A free decentralized cryptocurrency everyone can use and create. 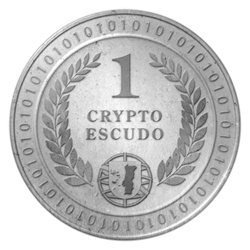 CryptoEscudo is a project planned and launched by Portuguese citizens, in which everyone is invited to participate. The idea is developed from the recent and innovative technological concept of cryptocurrency. A concept that changes everything we know about money: the way we use it, save it, or create it. A concept in which coins are created and used digitally in a decentralized and secure network, based on encryption. We're talking of the blockchain technology. The Portuguese cryptocurrency is not created or controlled by any banks, governments or companies. It is an encryption-based currency that takes its security from the complex calculations involved in it, being transparent and public to all, with its own blockchain. It is the digital reaching to money, as it has reached writing... music... communications. The name of our old currency "escudo" is not intended to represent the desire of returning to the past. It represents a reminder of our path to show us and guide us on a new and better future. Let's make our new money. Created by everyone and for everyone. Because cryptocurrencies have the power to influence and can provide mechanisms to a highly developed economic democracy sustained on transparency and reasonable privacy, helping a substantial part of the economy to overcome some of the common limitations of the traditional financial system. Because global cryptoeconomy is developing fast and it represents an important opportunity to develop and boost national economies, many of them still submerged in crises. Because and additionaly to all said above, we see in the cryptosystem, if well planned and largely accepted by citizens, a unique opportunity to solve a serious problem for our country - the national debt problem. Because it allows savings and/or acceleration when compared to other traditional payment systems (like cheque payments or bank transfers) with very low fees. Because it is a digital payment solution with its own blockchain safe and secured with cryptographic functions anyone can use with no burocracy, age restrictions or amounts. Because you simply need to have your own wallet without any need for signing up or registering and without sharing any kind of personal details online. Create an international community of CryptoEscudo users (people and companies). People will be able to either start using CryptoEscudo as a new form of payment (instead of fiat currency or credit cards) or to use CryptoEscudo as a new saving product, if they wish so. This will have a progressively positive impact on CryptoEscudo value. It is expected the progressively growing use of CryptoEscudo and everyone's interest around it makes the value grow until it finally reaches the desired nominal value of 1000â‚¬ = 1CESC. We think this can take 5 to 25 years to reach. 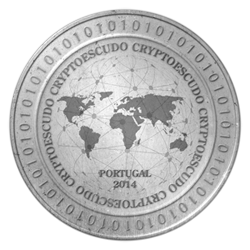 Distribute part of the total CryptoEscudo by the Portuguese people (about 15 000 000) living in the country or abroad. 15 CESC will be given to each Portuguese person who can prove his/her nationality and has not received them yet according to our records. This is expected to be a long and complex process that shall begin on April 25, 2014, a simbolic date and a national holiday known as the "Freedom Day", when a military coup in Lisbon changed the authoritarian regime into a democracy. We think this progressive distribution to the people will start to develop a growing interest in CryptoEscudo and also in its use. Achieve within 5 to 25 years a growing nominal value for CryptoEscudo until it reaches, at least, 1000â‚¬. Appreciation of CryptoEscudo shall be enough to pay our national public debt, which is about 220 000 000 000 Euros at the moment we are launching CryptoEscudo. This makes our national debt per person greater than 20 000 Euros. CryptoEscudo intends to use the global market's behavior to generate and appreciate the necessary cryptorichness to put an end to a serious problem that affects us all as a nation. Part of the total CryptoEscudo available in the network will be reserved for this purpose. CryptoEscudo features make it the most interesting national coin project for the non national citizens. Shall be used to pay Portuguese national debt when 1 CESC reaches the value of 1000€, which can take several years to be achived. Starting on April 25, 2014, each Portuguese will receive 15 CESC after presentation of an ID document. Will be used to promote, develop and maintain the entire project in every possible ways during the following 25 years. Available on CryptoEscudo network to be mined during the following 20 years, for anyone who wishes to. Share this project and use CryptoEscudo. Start by downloading CryptoEscudo wallet - the software you need to store and manage your coins. After download completed and with an internet access, your wallet will start to synchronize with CryptoEscudo network in order to be ready to mine new coins. By trying to solve complex cryptographic problems, your computer will sometimes be able to claim for yourself a new generated block of CryptoEscudo. Some other times, other users, also connected to the network, will claim for themselves a new block instead of you. Think of this process like the equivalent of printing fiat currency. Follow CryptoEscudo on social network to keep informed and join our forum at CryptoEscudoTalk. CryptoEscudo success depends on us all. See more ideas to support CryptoEscudo. © 2014-2019 CryptoEscudo | CryptoEscudo ® is a registered mark at INPI.